This year, I decided to list a family favorite recipe from the blog (with any adaptions that we use regularly, if applicable) on the fourth Friday or Saturday of every month. This recipe will be one that we make quite often and that we all enjoy greatly. This post is the tenth Family Favorites recipe of 2018. 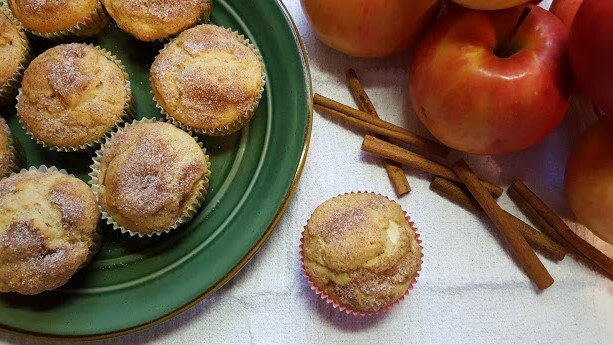 This month's Family Favorite recipe is Gluten-Free Apple Cinnamon Muffins. 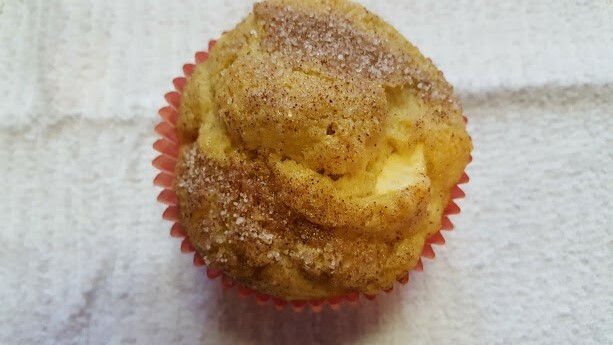 This is basically a re-post of my Gluten-Free Apple Cinnamon Muffins, but with some extra tips and tricks. This recipe is nut, wheat and fish-free (as long as all of your ingredients are), and can be milk, soy and egg-free (see variations). It is also the recipe that my dad (who is not gluten-free, by the way) requests every time he comes over or whenever I go over to their house. These are also the muffins that get eaten the quickest by my family when I make muffins. In fact, my husband purposely buys more apples than we can eat so that I can make these (along with a pie or crisp or fruited coffee cake - or all of the above). 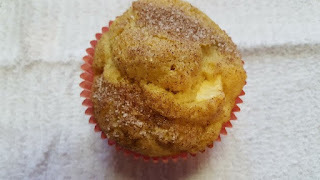 I promise you - these are some of the best apple cinnamon muffins on the planet - gluten-free or gluten-full. No one ever suspects them of being gluten-free (and I still don't know why people assume gluten-free = awful because it is simply not true), and they always want more! Give them a try - you won't regret it! Note: The gluten-free baking mix I recommend does not technically contain soy, but it does contain xanthan gum (see "Soy-Free" under variations for more details) which can cause issues for people with soy sensitivities or allergies, and that is why I will not claim that this recipe is soy-free. Prepare muffin tins with 24 paper cups or grease tins well with fat of choice. In a medium bowl, mix the gluten-free baking mix, sugars and cinnamon until well blended and set aside. In another larger bowl, mix the oil, egg, milk and vanilla until well blended. Add the dry ingredients to the wet ingredients until the mixture is just blended. 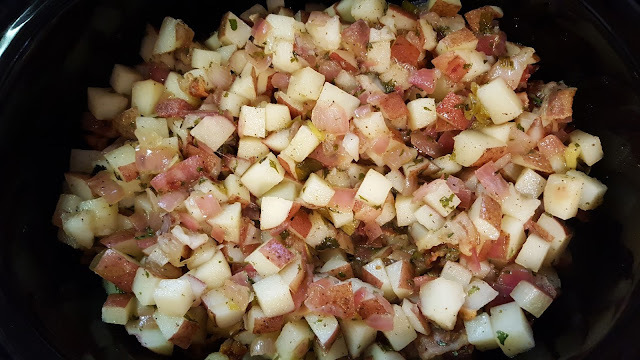 Fold in the diced apples until evenly distributed. Bake the muffins for about 20 to 25 minutes or until a toothpick or cake tester comes out clean. Let the muffins sit in the pan for about 5 minutes before removing them from the pan and allowing them to finish cooling on the counter or a wire rack. Enjoy them warm or let them cool completely before enjoying - whichever you prefer! Milk-Free: Use non-dairy milk of your choice in place of the milk, and use either paper cups to line the tins or a non-dairy fat to grease the pans in this recipe. You could also substitute apple juice or cider for the milk. Egg-Free: Use an egg replacer in place of the eggs. For ideas on what to use in place of the eggs, check out my ingredient substitutions page. The flax seed "egg" or applesauce replacement would be a good fit with these muffins. Soy-Free: King Arthur Flour's Gluten-Free Baking Mix does not claim to contain soy, but it does contain xanthan gum, which can cause issues with people who have soy sensitivities and allergies, and hence the reason I won't claim this recipe is soy-free already. You can use another soy-free baking mix (if you can have wheat/gluten) or soy-free, gluten-free baking mix of your choice. Keep in mind that if your baking mix doesn't contain guar gum or xanthan gum, you may need to add between 3/4 to 3 teaspoons of ground flax seed, guar gum or xanthan gum to help with textural issues, too. You'll have to make sure all your ingredients are soy-free, too. Different Flavors: If you are not an apple fan, you can substitute raisins, dried cranberries, peach, strawberry, blueberry, raspberry, or another fruit of choice (though I don't recommend pumpkin, banana or any other "mushy" fruit). You can use a combination of fruits, too, as long as you don't exceed 1 1/2 Cups of fruit. I recommend using fresh fruit or dried fruit ONLY, as canned or frozen fruit will alter your texture greatly. You can also leave out the cinnamon if you don't like it, as well. You can also top the muffins with plain sugar or nothing, if you so desire. You could also play around with different juices for the milk like orange, lemon, lime, or pineapple, leave out the cinnamon and cinnamon sugar topping (unless you want the cinnamon flavor), and pick a fruit or dried fruit of choice to mix in. For example, for a Cranberry Orange Muffin, I would sub orange juice for the milk and stir in dried cranberries vs. apples, leave out the cinnamon, and top with just plain sugar. That would be heavenly, I think! You could also try stirring in chocolate chips vs. fruit, with or without the cinnamon and cinnamon sugar topping. That would be delicious, too! Sugar Substitutes: You could use any sugar substitute that is approved for baking for the sugar. Make sure that you sub it according to the recommendations for that sweetener. Not all sugar substitutes are subbed with a 1:1 ratio. I also don't recommend using a liquid sugar substitute as it would greatly alter the moisture content. 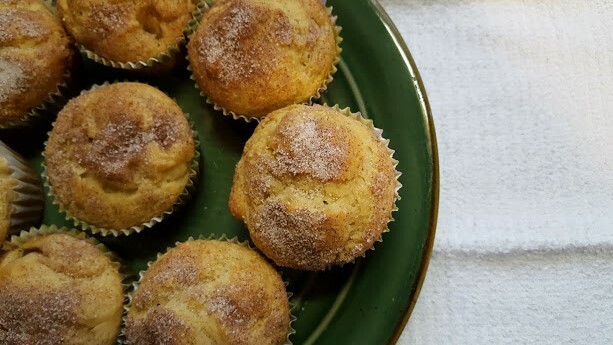 I promise, you won't regret trying these muffins! They taste as wonderful as they look! This is the tenth Recent Reflections post of 2018. Recent Reflections goes live the third Friday or Saturday of each month. Each Recent Reflections post covers something that I'm reflecting on. If you'd like to share a post with a similar theme, feel free to leave a comment with a link to your post, and I'll hop on over and leave a comment (and maybe some other readers will, too). 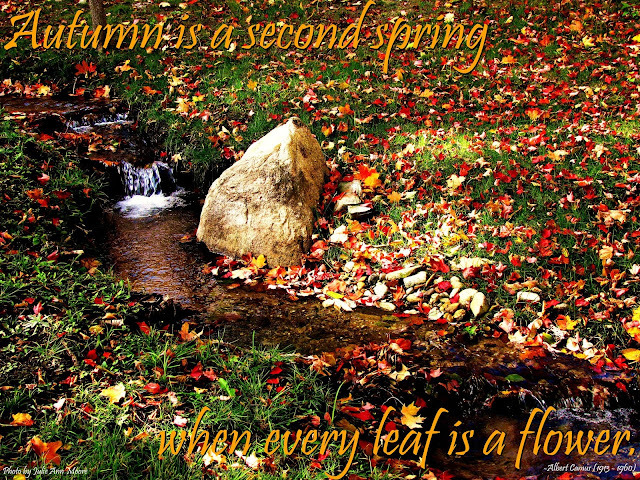 This month, I will be reflecting on autumn in all its glory. Autumn is without a doubt my favorite time of the year. I love the colors, the crunchy leaves, the cooler weather, the cozy sweaters, the fuzzy socks - I just love all the things comfy and cozy and colorful that come with this time of year. It is this time of year that I feel the absolute fullness of God's love in every sensory form. I am always amazed that God gave us color to enjoy. I mean the absolute splendor of autumnal trees - the vivid reds, the hypnotic oranges, and the golden yellows just take my breath away. God did not have to give us such beauty, but He did. God loved us so much that He gave us beauty in nature to enjoy all year through, but I think it is at its peak in autumn. And the smells! There is something about the smell of autumn. Maybe it is the apple trees and pumpkin patches, or maybe it is the smell of the leaves or wood smoke from fireplaces, or maybe it is all the baking that tends to happen this time of year (probably to keep the house warm and the heat bill down a bit), but there is just something about all of those delicious aromas that is just relaxing and revitalizing. It is a treat for the senses, and it makes me realize just how good God is to give us such amazing things to enjoy. Then there is the feel (and sound) of crunching leaves and frosted ground under your feet. This is another undeniable pleasure that this time of year brings for me. There is something just so satisfying about the ability to feel and hear that crunch with each step. I think I can liken it to popping bubble wrap. :) How awesome of God to give us His version of bubble wrap to "pop" to help relieve any stresses or help soothe a bad day! That's love right there, folks. Have you ever stopped to think about the other sounds of autumn, too? Brisk winds, rustling leaves, crackling fires - so many different sounds, and they all have a soothing quality. There is just something about it that is almost hypnotic. It will soothe your woes and calm your heart. How wonderful of God to give us a time of year to enjoy sounds that are both indoor and outdoor with equal frequency! In my opinion, nothing can beat the taste of autumn. There is something about autumn apples that cannot be beat. Then there's the pumpkin everything! Let's not even mention corn, squash, and all the other wonderful things that abound this time of year! This is a time of plenty and harvest, and you can't help but think of all that God has blessed you with. It so is easy to feel rich and blessed with so much food around us at the ready, isn't it? God is so great to give us so much! I think that all of these things - the visual, the smell, the feel, the sound and the taste of autumn - are why this is the one time of year people venture to my neck of the woods (Northern Lower Michigan) vs. going south. This is one of the places where you can truly experience all of autumn's splendor at its finest, and that is definitely something you must do at least once in a lifetime. It makes one appreciate everything that God has given us, and it makes me truly thankful and feel beyond blessed! Autumn is finally here in all its beauty and cooler weather (as I type this, it is 45oF outside and blustery). I absolutely love it! Fluffy sweaters, warm blankets, cozy socks, warm cider - right up my alley! 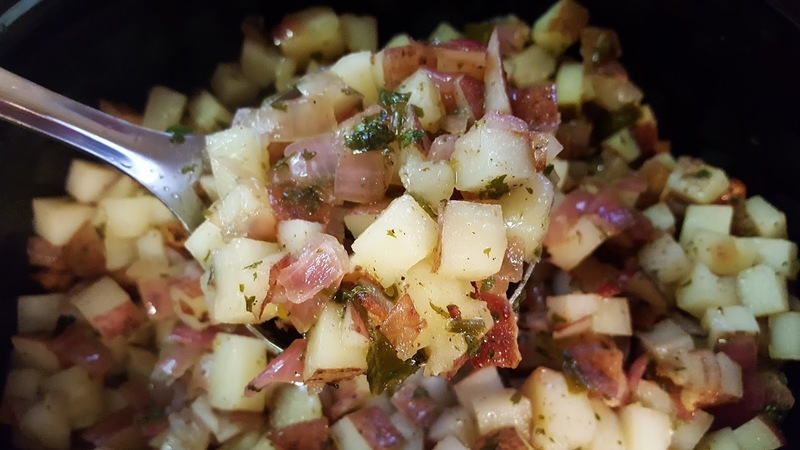 It is the perfect time to make hot dishes like soups or casseroles, and a great time of year for this German potato salad! 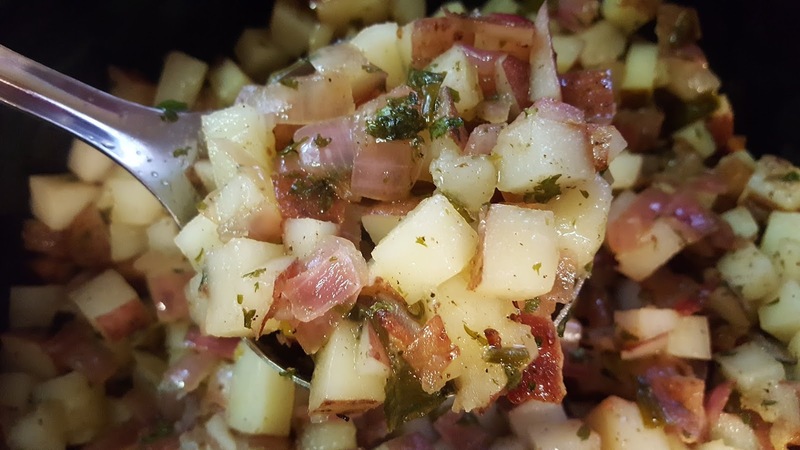 Unlike your picnic-type potato salad, German potato salad is served hot and has a bit of a tangy, yet sweet taste to it. I honestly think it tastes a bit like it has BBQ sauce in it, so if you like BBQ potato chips or BBQ sauce with potatoes, this is for you! This recipe is an adaption of one I found on Genius Kitchen by breezermom. It is so easy to make, tastes delicious, and is free of all top 8 allergens (if all your ingredients are). I have made it for more than a few potlucks (it is great for Missions Conference or themed meals if you need a non-American recipe) with rave reviews. I hope you try it and it becomes a fall favorite for you and yours. 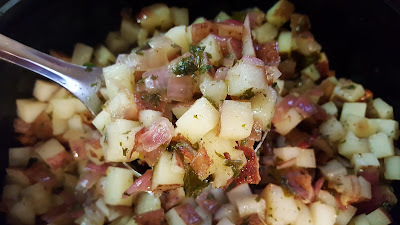 Add the parsley and the potatoes (bacon, too, if using vs. ham) into the skillet mixture, stir well, and heat through. Once everything is heated through, transfer to a serving dish or crock pot and serve warm. Using Ham and Bacon: If you want to use both ham and bacon, you certainly could. You could use 1/2 lb. of each or 1/2 lb. total - whatever you fancy. Bacon on Top: If you want your bacon to stay crispy, sprinkle it on top of the dish vs. mixing it in in step 5. You can also mix half in and crumble the rest on top - the choice is yours. Fresh Parsley vs. Parsley Flakes: If you want to use fresh parsley, you may. Just reduce the amount to 1 teaspoon vs. 1 Tablespoon. Alternative Sugars/Sweeteners: White sugar adds a very distinct taste to this dish, and I'm not sure brown sugar, maple syrup, honey, Stevia or any other sweetener will work right flavor-wise for this dish. However, if you wish to try it, you may. Just substitute according to the recommendations on this chart. I promise, it tastes as good as it looks! What is the 1st thing you think about when you hear October? Probably due to haunting experiences of sugar comas and cavities, I think of black and orange scary decorations all over the place! Or running to the local tool shop and nasty looking skeletons pop out at me making awful growls! You know what else is scary and gross in October? GERMS! The start of colds, flus, runny noses, fevers, coughs, and just all that fun stuff that just goes around and around and around! Well, here’s your helper to stop that bug infested merry-go-round from spinning! Fall season can be beautiful! Leaves change, winds get brisk, and we cozy up with a cozy fire and a cozy blanket (Heavenly!). Well, as we’re busy getting cozied, so are those germs ((YUCK!)). We all know it’s better to prepare and prevent than to endure and suffer, so grab the Thieves! Interesting name right!? Here’s a quick note on why! During the plague, law officers were on the hunt for a few men who were stealing from the perished! Graves of the plagues fallen were being robbed and yet it seemed that the fatal germs weren’t affecting the robbers….but how!? Once the men were caught, it came out that they were 4 spice merchant traders who’d figured out the poultice blend of Clove, Cinnamon, Rosemary, Eucalyptus and Lemon had such an impact on their bodies and immune systems that they avoided catching the plague!! And in lieu of imprisonment, they shared their recipe! Ok, so back to why it’s time to grab it! So, if it held up against such a nasty time, just imagine how your life can change by having a bottle in your home! We are going to be around sick people or, at the very least, those lingering germs left behind wherever those effected have been. We can’t avoid grocery stores, we can’t avoid family get-togethers, and we just can’t live in a bubble, because if you’re wrapped up in plastic, then you’re going to need more than just oils to help! How do I incorporate Thieves into my world!? Ok, honestly, it is used DAILY in MANY ways, but our top aromatic way is add 2 drops to my diffuser. Not only does it freshen the air, it works on attacking any lingering germs! 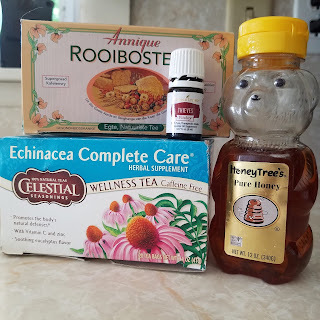 The other immune boosting support I use it for is tea! And, oh my germ destroying goodness, is it a boost of sweet and spicy warmth! If I’m dealing with a throat or sinus irritation, THIS relieves it. And even if you’re healthy tip to toe? Drink this anyway! What better way to prevent and boost! * - Click on the link to view the ingredient list to see if this ingredient is right for you and fits your individual allergen needs. Note that the oil mentioned is the Vitality variety. You can search the other oils and blends here. Thieves is a VERY strong oil and a VERY spicy flavor! Start with one drop because you may find it perfect! If I’m making a very large thermos then I may increase the amount of drops, but I do so slowly!! Essential oils are picky on how they respond to temperature, so it’s best to add Thieves after you’ve heated and dissolved the honey so you get the most benefits! Ready to make your own Thieves Tea or want to know more about how to get your own oils? 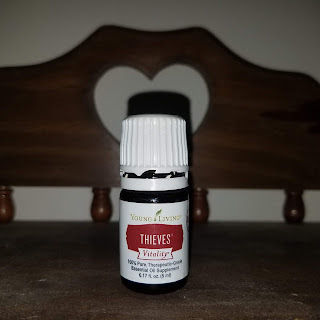 I hope you all have enjoyed learning a little more about Thieves essential oil. If you have further questions, please leave a comment below and Jess will respond as she is able or contact her via her "Contact" page.